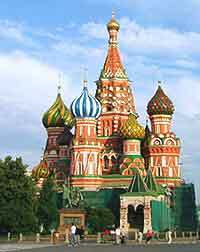 Now the capital of Russia, the city of Moscow holds a long and interesting history, spanning some nine centuries. Settled alongside its namesake river, the Moskva, the city hails from the middle of the 12th century, when Prince Yuri I Dolgorukiy chose this spot as the site of a well-placed fortified town. A high wooden wall soon encircled the town and this provided great defence, being known as the Kremlin. Moscow's strong start was to experience many difficulties and trials over the years to follow. The settlement quickly found its feet and the remainder of the 12th century was one of steady growth and relative stability. This was to end in the late 1230s, when barbarians from the Mongol Empire attacked, setting fire to the city and killing all of those who lived here. However, a new and more determined Moscow soon rose, with its enviable position alongside the Moskva River and proximity to the Volga River enabling trade and transport. Many emigrants and refugees arrived at this time, quickly swelling the population. Ivan I Danilovich Kalita reigned as the Prince of Moscow from 1325 until 1340, and he was very much responsible for the city's rapid rise in status. He soon ousted 'nearby' Tver as the Vladimir-Suzdal Principality's centre of politics and the city began to collect taxes for its Tatar (Turkic people) and Mongol leaders of that time. The year of 1480 was to be a pivotal point in Moscow history, since Ivan III of Russia (Ivan the Great) successfully led the path to independence, freeing it from the chains of the then Tatar regime, and the city soon became the centre of Russian power. All was going well and Moscow was enjoying its elevated status and importance in Russia, becoming the capital of a simply vast empire. However, the Crimean Tatars had their sights on the city and attacked in 1571, burning virtually everything to the ground, except for the Kremlin. War, rebellions, plague epidemics and uprisings followed during this unsettled period, with the Swedish army wading in between 1609 and 1611, in an attempt to regain peace. After their victory at the Battle of Klushino in 1610, the Polish-Lithuanian army soon took control of the city. In 1712, Moscow was replaced by St. Petersburg as the capital of Russia and its aspirations quickly vanished. A devastating plague epidemic made itself known in the early 1770s, claiming the lives of approximately 100,000 Muscovites (residents of Moscow). The Grande Armée of France, led by Napoleon Bonaparte, headed to Moscow in 1812, as part of the French Invasion of Russia. Locals knew that it would not be long until the army arrived and so chose to flee, burning their beloved city behind them. It is estimated that as many as 400,000 of Napoleon's troops perished, due to cold temperatures, lack of shelter and starvation. Moscow was to rise from the ashes again, once the French had retreated. At the turn of the 20th century, a City Governor was to be elected to preside over Moscow and Alexander Adrianov was chosen to become the city's first ever 'mayor'. In 1917, the city witnessed the Russian Revolution, when Bolshevik forces marched on Red Square (Krasnaia Ploshchad), challenging the Tsarist autocracy and marking an end to the monarchy of Russia. Following the revolution, Moscow's status as capital city was returned in 1918 and it became the official Russian Soviet Federative Socialist Republic capital. World War II was understandably a time of great conflict in Russia, and with Moscow being its capital, the Germans soon made their presence known. The National Army of the Soviet Union (formerly the Workers' and Peasants' Red Army) based itself here and protected the city against continued attacks, being overseen by communist Joseph Vissarionovich Stalin. Despite all of the bombing and damage being caused during the war, Moscow confidently chose to continue with the construction of its modern metro train network, which was opened when the war ended. Moscow was delighted when it was chosen to play host to the prestigious Summer Olympic Games of 1980 (Games of the XXII Olympiad), although following the Soviet Union's recent involvement with Afghanistan, athletes from the USA and some Western countries chose not to attend for political reasons. In the year of 1991, a failed coup in the city marked the dissolution of the USSR. Nowadays, Moscow is a modern city with a global economy. Shopping malls, international restaurants and stylish contemporary architecture grace the streets of the capital, although you only have to take a stroll around the open-air museum that is Red Square to observe its living history and heritage. 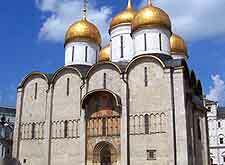 Here you can admire icons from the past such as the Kremlin, St. Basil's Cathedral (Sobor Visalia Blazhennogo) and the Tomb of Lenin (Mavzolei VI Lenina). The State History Museum (Gosudarstvennyi Istoricheskii Muzei) also resides on Red Square.